The battle over your online identity rages on. Google Friend Connect, the search giant’s platform that lets you accept Google and OpenID accounts on your site, has just made implementing the service about as easy as it could be. And it did it exactly two days after Facebook released its own streamlined install process for Facebook Connect. Except Google’s is better. Up until now the install process for Google Friend Connect hasn’t been too difficult — the site walked you through a handful of steps, asked you to upload two files via FTP to your webserver, and you were done. Up until very recently Facebook Connect’s install process was significantly more confusing, but two days ago they updated it to closely match Google’s flow (though you only have to upload one file instead of two). Today Google has managed to one-up Facebook once more: Friend Connect’s new install flow doesn’t require any file uploads, which opens the door to an entirely new set of users. 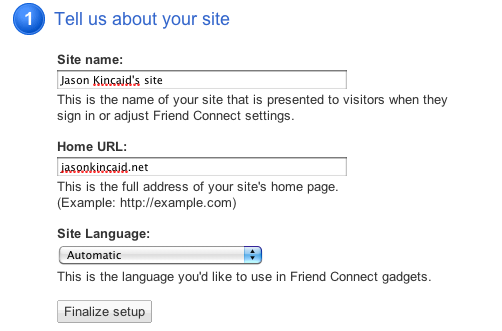 Now all you need to do to implement Google Friend Connect on your site is visit this page, enter your site’s name and URL, and you’re done. Google will present you with a gallery of HTML widgets that you can copy and paste into your site. Aside from making things easier, this opens the door to a new set of users. Namely, people who either don’t know how to use FTP, or who run their sites through hosted services that don’t grant FTP access — and there are a lot of them. Looking at raw numbers, Google Friend Connect appears at first glance to be besting Facebook Connect by a large margin: Google reports over 5 million sites using Friend Connect, while Facebook Connect has around 15,000. But those figures are misleading. In terms of mind-share, Facebook Connect is running circles around Google Friend Connect — just look at how many mainstream sites use Facebook Connect but not Google. Facebook has made it clear that it’s trying to attract more small sites that don’t have development teams, so don’t be surprised if it strikes back with its own super-streamlined install process in the next few weeks.